(Modified at 5:00PM PST, March 5, 2012 - per revised information from ARM). The Game Developers Conference (GDC) kicks off in San Francisco today. With games occupying the top position in mobile application downloads, most importantly for paid apps, GDC will be the scene of intensified competition amongst CPU-GPU (Central Processing Unit, Graphics Processing Unit) providers seeking to attract developers to their silicon platforms. Intel gave an early peek at a port of their Graphics Performance Analyzers (GPA) for the Medfield smartphone platform at Mobile World Congress last week, and today ARM Holdings, developer of ARM Cortex CPUs and Mali GPUs, released an update to their Development Studio 5 (DS-5™ v5.9) tool chain with additional support for graphics analysis..
Anand Patel, Mali Tools Product Manager at ARM, says the the new capabilities in DS-5 v5.9 enable developers to optimize performance and power across an entire system, including both the applications processor and GPU. ARM offers DS-5 in three different versions, Professional, Basic, and a free Community version, to address the entire mobile development stack from semiconductor and handset manufacturers, to middleware providers, to Android application developers. Patel says that DS-5, which ARM introduced in March 2010, has primarily been used by silicon providers and Original Equipment Manufacturers (OEMs), to debug processors or analyze soft models of CPU cores. With the new graphics features and the free version, ARM is attempting to reach out to a larger audience of game application developers. 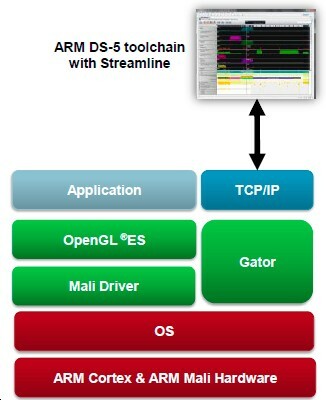 ARM has based DS-5 on the popular Eclipse Integrated Development Environment (IDE). 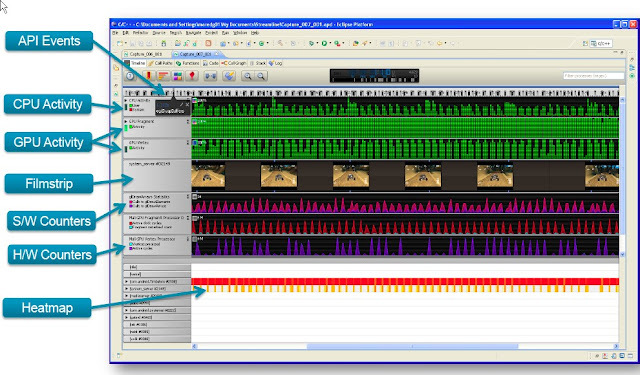 The Streamline™ Performance Analyzer in DS-5 allows developers to separately monitor activity in their applications processor's CPU and GPU cores, and track application programming interface (API) calls . Patel says that the software (S/W) and hardware (H/W) counters in DS-5, in combination with the Filmstrip feature, enable high-level analysis of activity associated with graphics rendering on a frame-by-frame basis.The Heatmap enables monitoring of activity associated with individual operating system processes. Android Developers can integrate the DS-5 toolchain with the Android Software Developer Kit (SDK) and the Native Developer Kit (NDK). Patel says that the addition of ARM's "Gator" interface to the operating system kernel and Mali drivers has negligible impact on system performance. Gator works with the Android Debug Bridge (ADB), to pass information from the development hardware to DS-5 over Transmission Control Protocol/Internet Protocol (TCP/IP). The Streamline Performance Analyzer in DS-5 works with the new ARM Energy Probe, which the company announced last week at Embedded World 2012, to enable developers to create more energy efficient mobile games and applications. The Energy Probe is built into a USB dongle, to provide a wired interface between the PC running DS-5 and the development hardware. The integration of Energy Probe with the Streamline Performance Analyzer allows developers to correlate power, current and voltage data with system performance counters and software profiling. The ARM Developer Studio supports a variety of processor platforms from ARM core licensees. According to Patel, DS-5 support (with graphics) will be enabled on Mali platforms supported by Linaro. Samsung Origen development board for the dual core Cortex-A9 Exynos 4210 processor with Mali-400 MP4 GPU. ST-Ericsson Nova Snowball development board for Android, Linux and Linaro embedded devices on the Nova™ A9500 platform. Hardkernel ODROID-A developer tablet, which is based on the Exynos 4210 applications processor. (Support expected in the near future).